Obviously, our home grown ‘Top Windsurfing Tips & News‘ should be your first port of call when it comes to getting info about anything windsurfing… You can’t get much better than FREE articles about technique, equipment, bargain buys, travel & windsurf news! You can use the simple sign up form just to the right of this post and start receiving your free windsurfing tips & news without any more effort. Now coming out bi-annually Boards Windsurfing Magazine is packed with 180 pages of high quality windsurfing info. Boards magazine has been running for over 30 years and is designed first and foremost to inspire and inform, featuring imagery from the worlds top photographers and editorial from the best journalists in windsurfing. In annual format, the content is focused on longer, higher quality articles brought to life with full page imagery. The Spring/Summer Annual of Boards Magazine focuses on the flat-water side of windsurfing, covering freeride, slalom, speed and freestyle, whilst the Autumn/Winter Annual puts its attention to the wave and freewave elements of the sport. Both editions will appeal to all types of windsurfer. Stocked at almost all local windsurf shops, selected WHSmiths stores and private newsagents around the country. You can subscribe to the Boards Windsurfing Magazine on their website to effortless receive your copies direct to your door. If you pay by direct debit, 2 issues will cost you £10.95 (as opposed to £12.50 when paying by credit card). If you are lucky you could also find a promotional code on the internet, to get further discounts off the price! Back issues of Boards Windsurfing Magazine can be purchased from the website & they go all the way back to 2006. Windsurf Magazine is published ten times per year: January/February, March, April, May, June, July, August, September, October and November/December. 1 years subscription of Windsurf Magazine costs £38 and like Boards Magazine, it can all be setup online & each issue delivered to your doorstep! 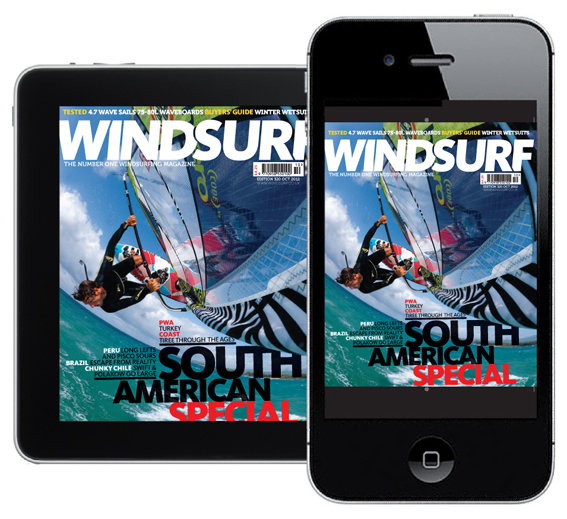 If you are on your game in terms of technology, Windsurf Magazine is now available in digital form for your iPhone, iPad or Google devices. Download the latest edition now.. Available for your iPad, iPhone, iPod and Android devices. Easy access to the latest issues of Windsurf Magazine. Get the most out of your device with a full screen experience. Quick access to reviews, technique and travel articles. Receive notifications when a new issue comes out. The best Windsurfing photo’s and stories from the biggest names in the business. Both are great magazines and really with one of them only coming out bi-annually, why not just get Boards & Windsurf Magazines? If you are really on a budget then maybe get the 2 Boards Magazines per year and then just top up with editions of Windsurf Magazine that have reviews/articles that take your fancy.